An ex-oilfield executive, Ian now lectures and writes on the geo-political webs that are being spun; with particular focus on US Hegemony and the NWO agenda for control of global resources. 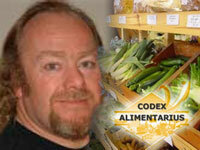 In this program, Ian discusses Codex Alimentarius and the New World Order. We begin talking about Ian's background in the oil business and what happened after the first Gulf War. More Topics Discussed: burning oil fields in Kuwait, 9/11, the future of food, Monsanto, Percy Schmeiser, growth hormone, cloned food, GMO, Ritalin, vitamins, Dr Robert Verkerk, Natural Health Federation, Natural Health Federation and Natural Solutions Foundation, controlled opposition: "The Codex Lady," Rima E. Laibow and her husband General Stubblebine, parapsychology military projects, The Men Who Stare at Goats and more. In hour two, Ian R. Crane talks about the New World Order's quest of Zion in 2012, the "new Jerusalem" and London. We also discuss the 7/7 bombings, the 2012 summer Olympics and the possibility of a fake alien invasion. Later, we talk about human origins as well as the possibility of the elite thinking they are descendants of the Anunnaki and how the psychopaths at top levels of power are trying to control everything natural and "unpredictable".